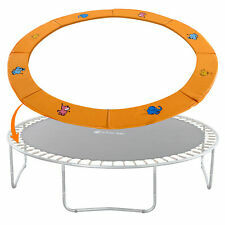 Encourage your kids to be active outdoors with our Trampoline! Quite simply, there is no better choice for your family. This Net Enclosure Combo is designed for trampolines with no existing enclosure net, Fits 15' trampoline with 5 U shaped legs. SkyBound USA. Trampoline Parts |. Trampoline Accessories |. This is important because trampoline nets are designed to fit specific styles. Use the chart below to help you identify your specific trampoline's enclosure style. Fits 15ft round trampoline. 1/2" thick EPE closed-cell foam for better shock absorption. 1 Set of Trampoline Pad. Material: PVC, EPE & PE. 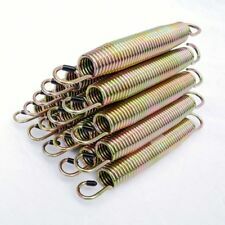 20pcs 7" Trampoline Spring. Features anti-UV, anti-fungal & anti-bacterial coating - supports outdoor use. 1x Round Trampoline Mat with 96 V-rings. Mat Size: 13.3' (160") Mat Diam. V-Rings: 96 Reinforced Galvanized V-Rings Sewn into the Mat for Extra Strength. Spring Size - Make sure the distance of hooks from tip to tip fits. As Good as Your Trampoline Initially :Through 17 processes to produce to ensure the quality. 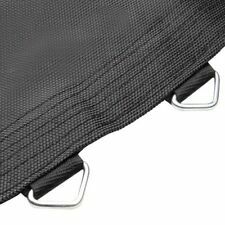 1 x Trampoline Pad Cover. High Safety：We choose High quality raw materials,3/5" thick closed-cell EPE foam and 18oz//m²(510g/ m²) PVC (Top & Bottom). Mat Size: 13.3' (160")Mat Diam; Fits 15 FT Trampoline with 96 Spring Holes & 7"L Springs, of All Brands. V-Rings: 96 Reinforced Galvanized V-Rings Sewn into the Mat for Extra Strength. Click for Full Description. Premium Quality! Free 2-4 days Shipping! Blowout Price! 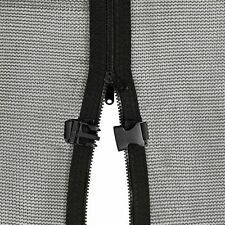 Features: Soft Mesh, UV stable and Anti-rotting Terylene Dual Closure Entry with Zipper and Buckles Straps with Quick-lock Buckles on Top & in Middle (Top strap length adjustable) Optional Fixing Rope to Secure Netting in Bottom Internal net, prolong the usage of safety pad and springs by avoiding jumping on them Specification: - 13.3' Diam.Netting with 3 Arched - Netting Height: 71"H Zipper Length:43.3" Fits: 15' Trampoline with 3 Arched Supports Important: · Please measure the outer diameter of your trampoline frame across the middle for the best match prior to purchasing. · Kindly note that the trampoline and arch or pole showed in the picture is only for photography and not in the package. Package Content: 1x Trampoline Netting. 1×Trampoline Rain Cover. Color: Black. Constructed from heavy duty water-proof PE material for long lasting use. The 15' Trampoline Cover transforms your trampoline into a fun jumping experience when the hot sun is out. Fits trampolines from 13 to 15 feet. 15' Trampoline Shade Cover. Trampoline not included. Accommodates trampoline with six enclosure poles. Featuring SkyBound's unique Sunguard™ material which protects your mat's crucial stitching from harmful UV rays and extends the life of your mat by up to 50% compared to trampoline mats without Sunguard™! SkyBound 159" Trampoline Mat w/ 96 V-Rings (Fits w/ 15' Frames & 7.0" Springs). Open box, but new. Trampoline Net FITS 12 14 15 ft Ring Enclosure Bouncing Bed 6/8 Pole Mesh Opt. Trampoline is not included. Fits 16 ft trampoline with 6 U legs. 1 x Trampoline Enclosure and Net. Enclosure only, Trampoline ont included. Net Enclosure Set. It is able to give the maximum protection to the kids, teens or adults from being scratched or trapped by the spring hooks and space between springs.. Cold Crack Protected; Anti-fungal, Anti-bacterial and UV Treated Coating. SPRING COVER ONLY! ITEM IS NEW! COLOR: PURPLE. LOCATION: 2-TD 115B. Fade resistant.